One of the most powerful ways to add context to your data visualizations is to include text analysis. In the Business Intelligence Dashboard Formula world, text analysis is defined as a short sentence or fragment that contains a combination of static text and dynamic values that describe one or more visualizations. The following figure shows a simple text analysis. The underlined words are dynamic, which means that they change based on the behavior of the data. Chart with text analysis statement with both static and dynamic text (underlined) that changes with the data. 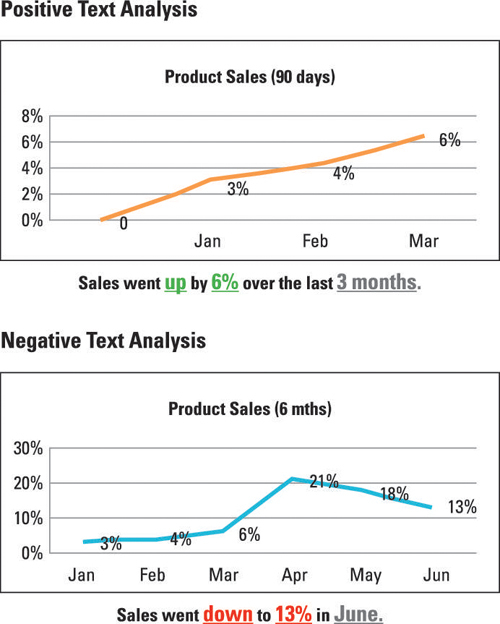 Think of text analysis as being a real-time description of what’s happening with the data. As the data changes, so does the descriptor. The trick is to create a statement that’s smart enough to suit all scenarios of the data as it changes. Here’s how the preceding figure was built. ALERT: The Expenses (dynamic text #1) monthly budget by (dynamic text #2). Scenario #1: ALERT: Expenses (have exceeded) monthly budget by (dynamic text #2). Scenario #2: ALERT: Expenses (have not changed) monthly budget by (dynamic text #2). Scenario #3: ALERT: Expenses (remain below) monthly budget by (dynamic text #2). Lastly, you need to fill in dynamic text #2. To calculate that rate for scenarios 1 and 3, do a simple formula to find out by what percentage the expenses exceed or are below the budget. Be sure to note the importance of not only covering all scenarios of the data, but also changing the wording as needed to ensure the sentence makes sense. This is obviously a simple example, but it’s a great place to start! When they first view a data visualization, most users do a two-part analysis. At first glance, they scan the visuals to get a sense of how the measurement is performing. Then, if time permits, they take a closer look at each visual to try to interpret what they’re seeing. Their brains do a series of scans, capturing numbers, words, and colors to gain a clear idea of the message that the data is conveying. You can use text analysis to eliminate this two-part process, however, by providing users everything that they need to know in a single glance. It prevents misinterpretation. If 50 people see a single visualization, chances are that none of them will interpret the visualization exactly the same way. By providing text analysis, you essentially help users interpret the visualization clearly and make informed decisions. It saves time. Providing a clear, text-based interpretation of what a visual portrays saves users time, because they no longer have to stare closely at the visualization to gain deeper understanding of the data. What: This element refers to what you’re actually measuring and usually is some form of key performance indicator or metric. Sales, expenses, margin, performance, and retention are all examples of measurements that you include at the beginning of your statement to let the user know what you’re referring to. What happened: This element describes the behavior of the metric and uses measurement terms such as high, low, up, down, increasing, or decreasing. This behavior can also be represented with symbols, such as arrows. By how much: This element describes the magnitude of change in some numerical value. Gauging the magnitude of any change is one of the best use cases for text analysis. When: A good guideline (when possible) is to include some reference to a time period to enable the user to gauge the effect of the change. The following figure shows two simple text analysis statements that describe the same chart. Notice that the underlined dynamic words change as the data in the chart changes. Incorporating dynamic text analysis into your data visualization makes your data truly intelligent. Including dynamic text analysis is low-hanging fruit with regard to your return on investment. It’s easy to do and will delight your users. Some users may even think that you have magical data visualization powers!